With Valentine's Day just around the corner, I'm sure many of you are–like me–anxious about what to get your loved one. Believe it or not, I happen to dislike the Holiday. It's riddled with awkward moments and too much money is wasted on stuffed bears, prix-fixe meals and roses. 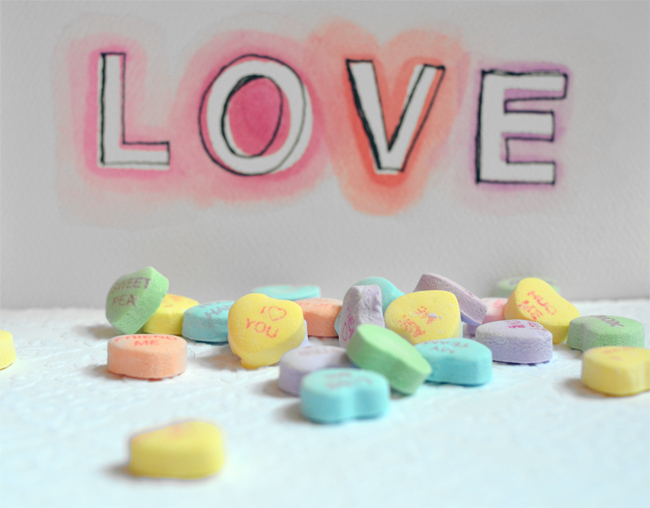 I do, however, LOVE Valentine's day candy...especially those chalky-pastel tooth breakers called Sweethearts. Every Valentines day, I look forward to an envelope addressed to me in my mothers distinctive handwriting. Inside is a perfect (albeit squished) box of Sweethearts conversation hearts. The perfect valentine! They're also about fifty cents a pop, making them perfect for those of you on a budget. This year I was so inspired by the chatty candy that I decided to make some for my husband Tom. The only glitch is that he happens to hate Sweethearts, so I improvised and made him the one thing I know he loves...pie! 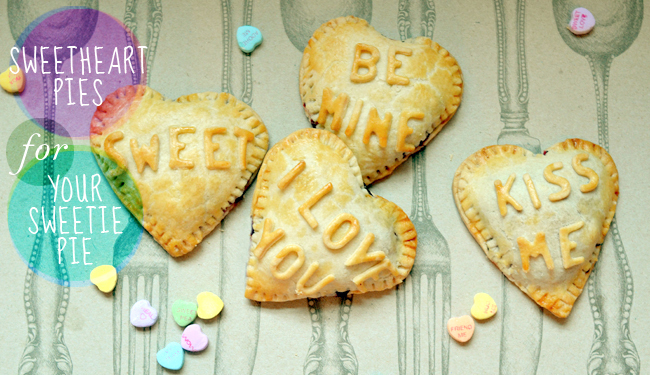 These Sweethearts inspired pies are easy to make and the perfect way to say I love you. I've included a simple pie crust recipe, but you can always use the store bought dough if your short on time. 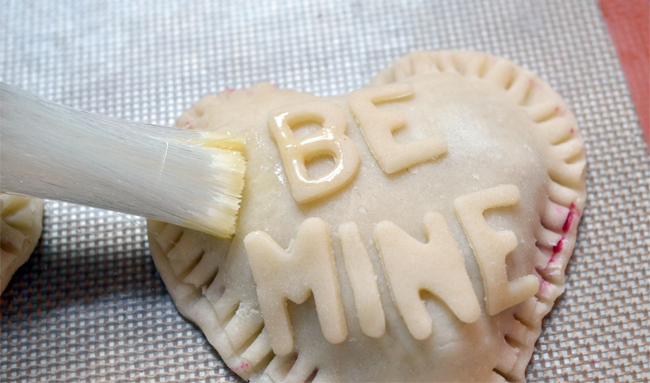 You can also vary your pie filling for your sweetie. 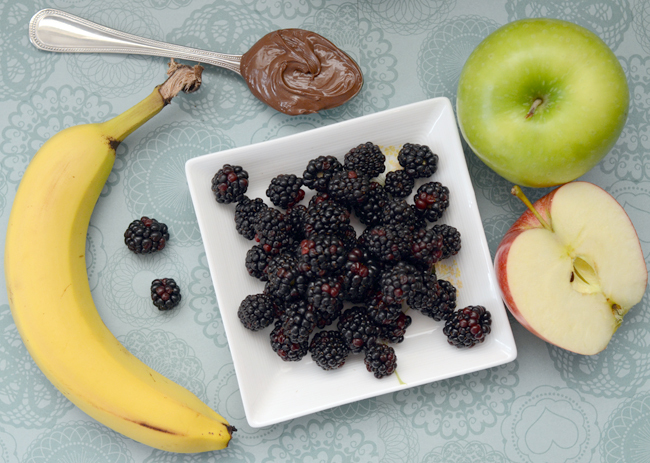 I used apple (Tom's favorite), blackberry, and banana-Nutella (my favorite) fillings, but you can try any filling with these mini pies. 1. 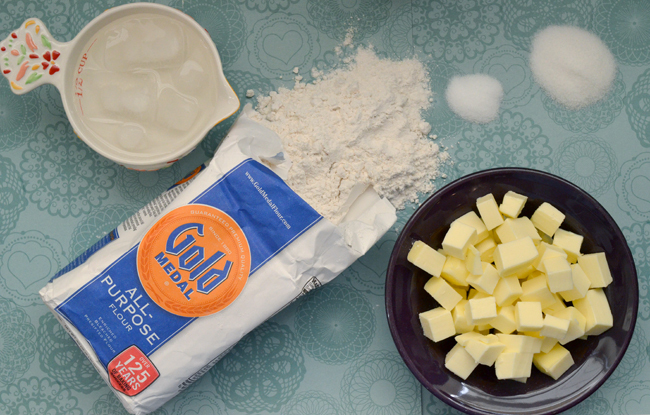 In a large bowl, combine flour, sugar and salt. 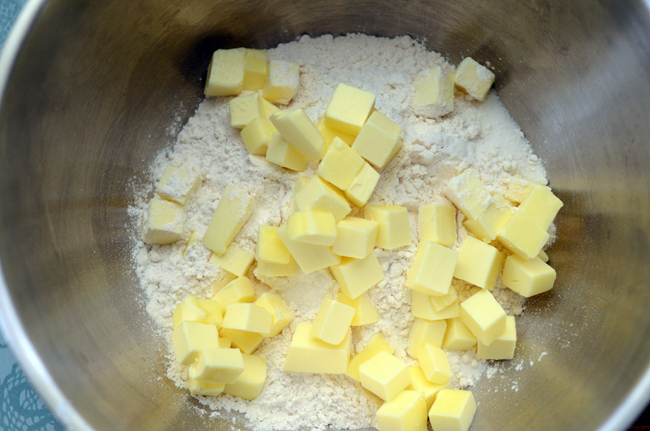 Use a pastry blender or a large fork to cut the butter cubes into the flour, working quickly and incorporating all of the flour mixture until the butter pieces are the size of tiny peas. Make sure you don't over-work the butter. Visible chunks of butter = tasty flakiness! 2. 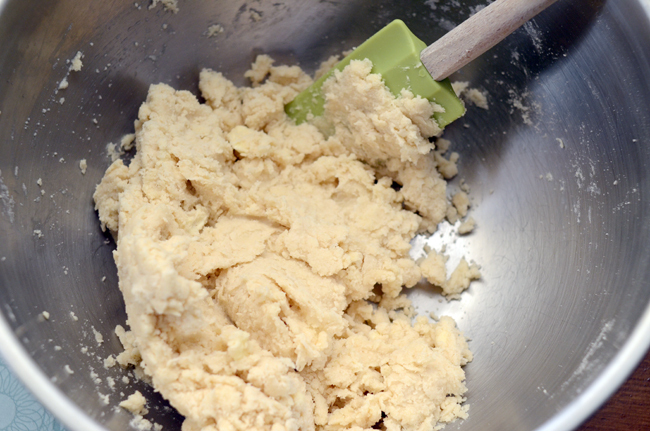 Using a rubber spatula, slowly drizzle the ice water into the flour mixture. Stir until the dough just begins to pull together, drizzling more water if needed. (You might not use all of the water.) Pull dough together into a ball. 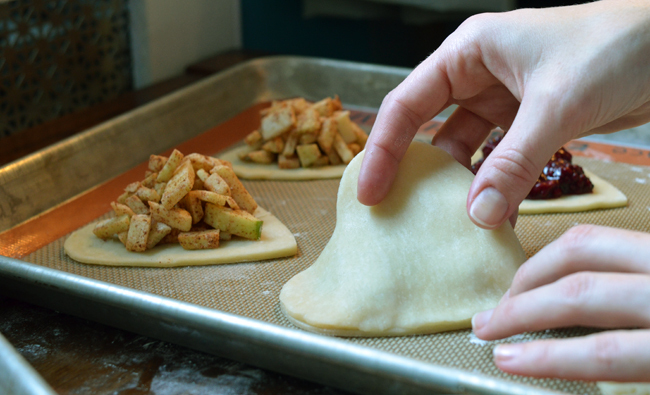 Divide the dough in half and place each half on a large piece of plastic wrap. Form the dough into a disk and chill in the fridge for at least one hour, before rolling it out. Blackberry: Combine 1 small package (about 1.5 cups) of washed blackberries, 1 tablespoon sugar, 1 tablespoon corn starch, 2 tablespoons water and a pinch of salt in a small saucepan. Cook until blackberries are broken down and juices thickened. Cool completely. 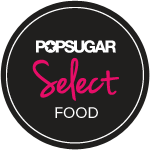 Apple: In a small bowl, combine one peeled and diced apple, 1/2 teaspoon sugar, 2 teaspoons cornstarch and 1/4 teaspoon cinnamon. Banana & Nutella: Thinly slice one banana. Spoon out 1 tablespoon of Nutella on pie dough then layer 5-8 banana slices on top. 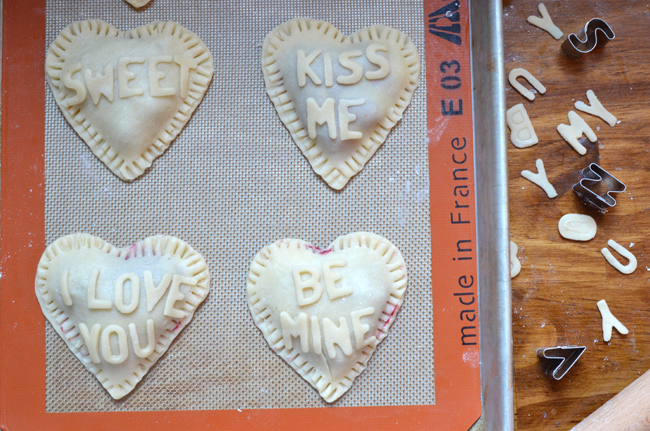 To make the Sweetheart Pies you'll need your dough, the prepared pie filling, small alphabet cookie cutters and a 4" heart cookie cutter. 1. Preheat the oven to 350 degrees. Line two baking sheets with parchment paper. Unroll one of the chilled disks of dough onto a lightly floured work surface. 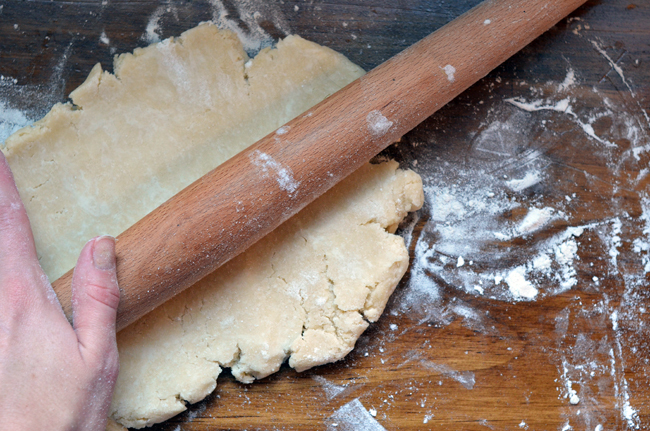 Roll out until dough is about 1/8" thick, rotating the dough often so it doesn't stick. 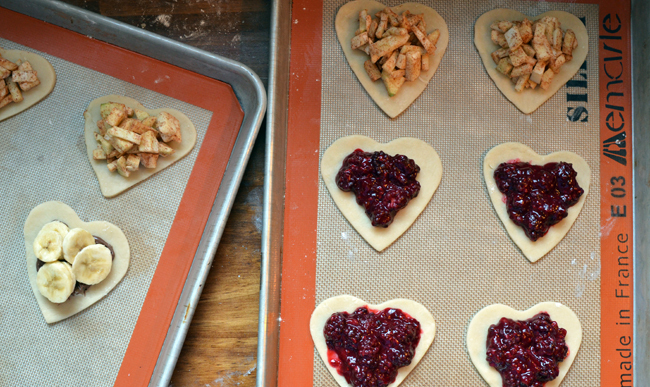 Using the heart cookie cutter, cut 9 hearts out of the dough and place about 2 inches apart on the cookie sheets. 2. Spoon out two heaping tablespoons of the filling into the center of each heart, leaving a 1/4" border of dough all around. 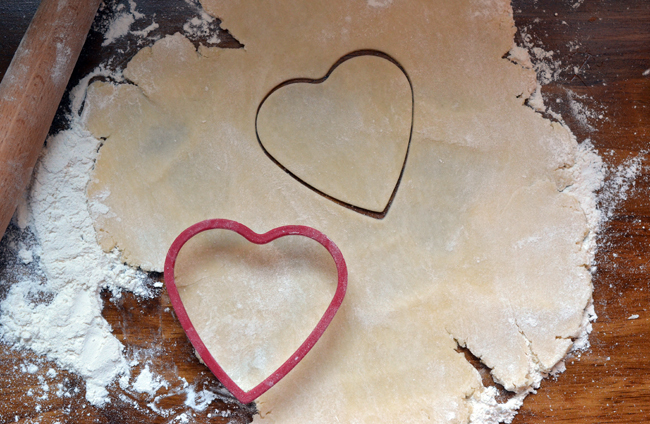 Roll out the additional disk of chilled dough and use the heart cookie cutter to make 9 more hearts. 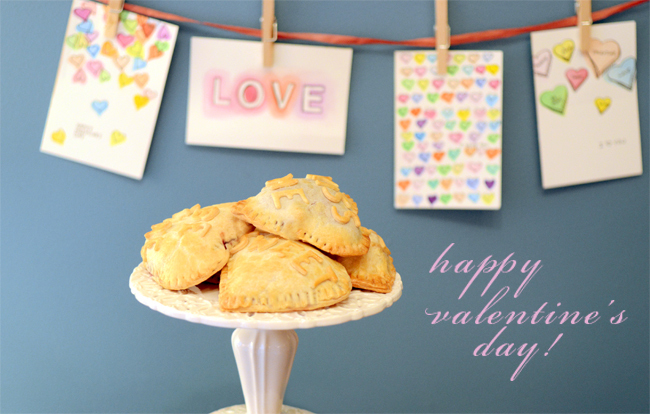 Use your finger to lightly dab water around the edges of the filled pies, then place the remaining dough hearts on top, sealing the edges with your fingers. Use a fork to crimp the edges together. 3. 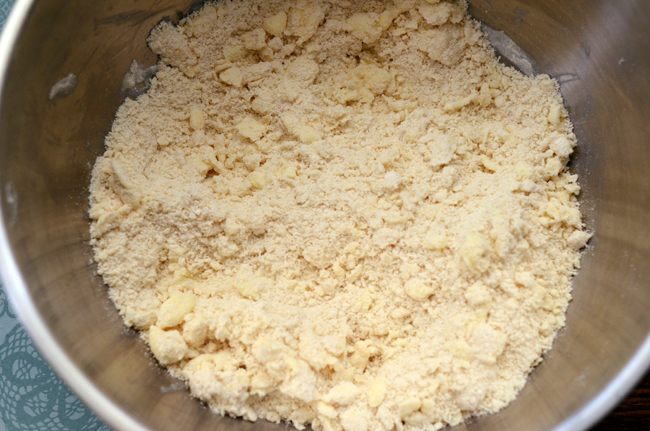 Lightly flour your work surface and gather remaining dough scraps. 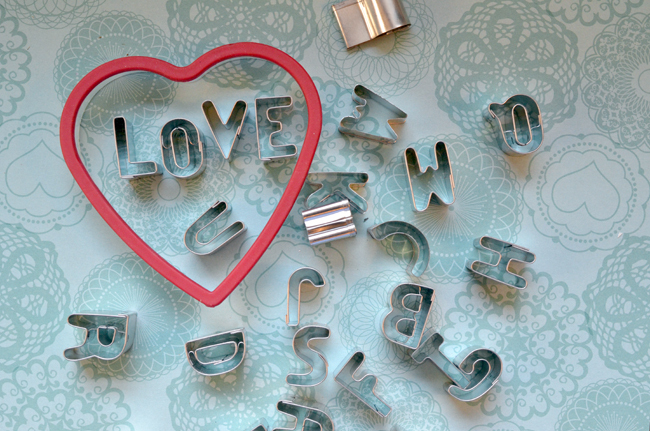 Roll out dough into a 1/8" sheet and use the alphabet cookie cutters to create your message. Use a scant amount of water to affix letters to the pies. 4. Make an egg wash by whisking an egg with 1 tablespoon of water. 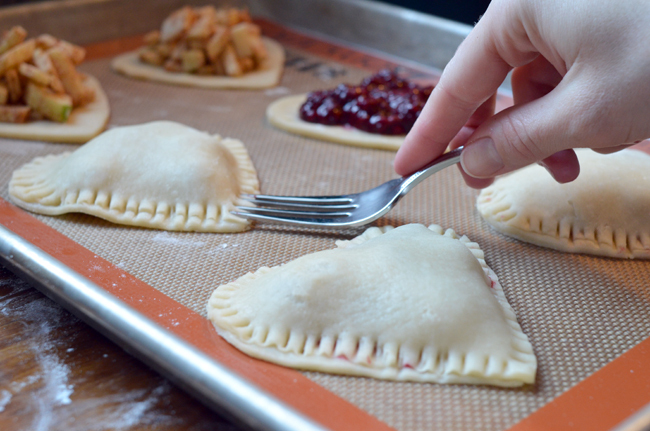 Use a pastry brush to brush the wash all over the top of the pies. Bake for 35 minutes, or until edges are a deep golden brown. 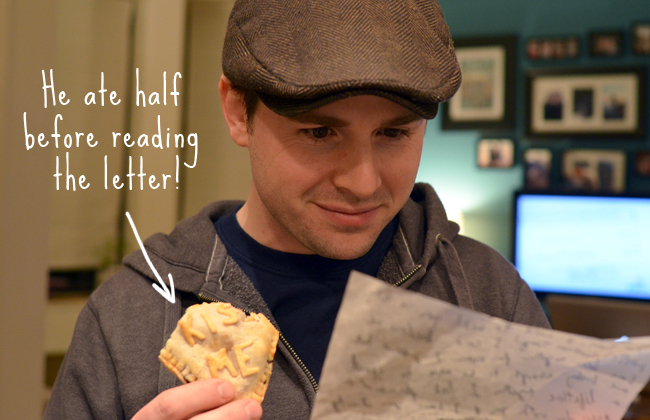 And for a personal touch, I decided to write Tom a Valentine's Day message and fold it into a little pocket to hold the sweetheart pie. 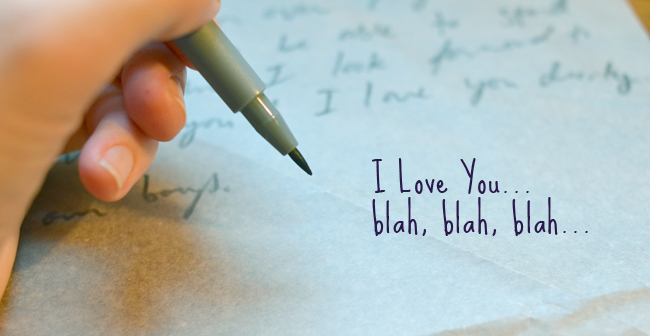 Just cut a piece of parchment paper into an 8x8" square and write your message. 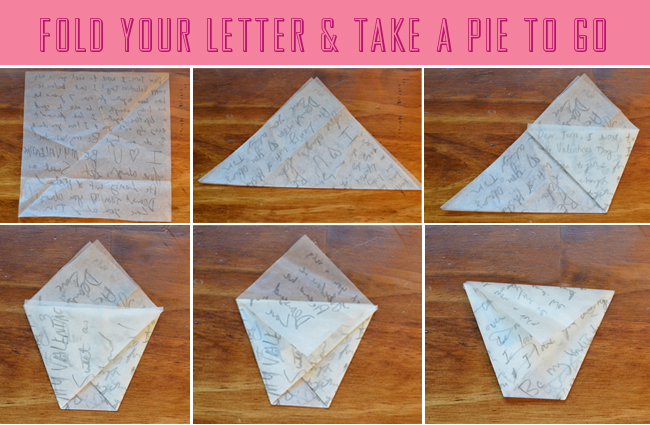 Then place a pie in the folded pocket (see folding instructions below) and give to your sweetie pie! These are beyond adorable. 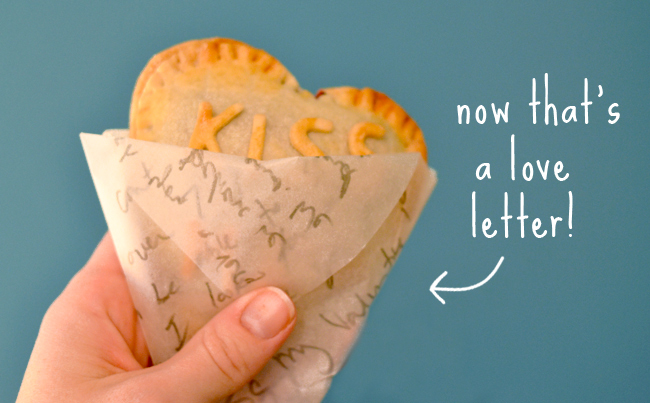 I love the pie-to-go paper too!